The Aayan™ Economy Suture Training Kit is ideal for medical and veterinary students learning surgical techniques, as well as professional surgeons looking to improve their skills. This kit provides all the necessary tools for students to enhance their technique safely and practically. 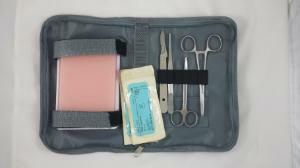 This 8 piece kit comes neatly packed away in a zippered case for easy access and storage. Caution: Sutures are intended for Training use only, and are not intended for human or animal use.